COMPRESSORE ABAC POLE POSITION L20 2 HP 24 LT MONOSTADIO LUBRIFICATO COMPRESSORE ABAC POLE POSITION L20 2 HP 24 LT È UN COMPRESSORE MONOSTADIO LUBRIFICATO DELLA GAMMA L20 DI ABAC., IDEALE PER L'ESECUZIONE DI PICCOLI LAVORI IN MANIERA MOLTO SEMPLICE, RAPIDA E SOPRATTUTTO AGEVOLE. 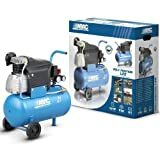 COMPRESSORE ABAC POLE POSITION L20 2 HP 24 LT UTILIZZA UNA NUOVA TECNOLOGIA NEL SETTORE DEI COMPRESSORI MONOSTADIO LUBRIFICATI CHE SI ADATTA PERFETTAMENTE ALLE PICCOLE LAVORAZIONI COME CHIODATURA E AGGRAFFATURA, SOFFIAGGIO E GONFIAGGIO. IL NUOVO DESIGN INTELLIGENTE È STATO STUDIATO PER GARANTIRE LA MASSIMA AFFIDABILITÀ E UN FLUSSO DI RAFFREDDAMENTO ECCELLENTE SUL GRUPPO POMPANTE. SILENZIOSO E CON SERBATOIO AD ELEVATA CAPIENZA, HA UN SINGOLO PULSANTE PER L'ACCENSIONE E PER LO SPEGNIMENTO E UNA SEMPLICE REGOLAZIONE DELLA PRESSIONE. PER LAVORARE IN MANIERA ANCORA PIÙ AGEVOLE QUESTO MODELLO DI COMPRESSORE MONOSTADIO LUBRIFICATO HA DELLE RUOTE RESISTENTI CHE FACILITANO LO SPOSTAMENTO. Abac 4116023464 – Compressore Pole Position L20 salvaspazio 024L 3.3 out of 5 based on 10 ratings.